A little more than halfway through the regular season, it’s safe to say the New York Islanders will make the playoffs. Beyond that, their fate is shrouded in mystery. So it is for every team in the Eastern Conference not named the Washington Capitals, the field of contenders east of the Mississippi pockmarked with has-beens (hello, Rangers) and wanna-bes (how goes it, Penguins?). And no, the Florida Panthers are not as good as they’ve looked. The race is wide open behind Ovechkin and Co., and someone, remember, will have to spar with the Caps to represent the East. And so a familiar refrain echoes in locker rooms around the conference: why not us? Without digging too far into the numbers, the answer varies by team. Defensive disorder (that’s you, Rangers.) Player incompatibility (and you, Penguins). Offensive instability, goaltending uncertainty, systemic confusion (welcome aboard, everyone else!) But here’s the thing: within that clutter of teams, no one feels that far off. A single move could vault any one of them ahead of the pack. The onus, then, is on the GMs to add those missing pieces to the puzzle. For Garth Snow of the Islanders, that means acquiring a top-end forward to play with John Tavares. With all due respect to Kyle Okposo, Tavares has never skated alongside a genuine star in this league. (Still, Okposo’s the man, isn’t he? 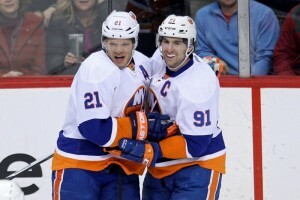 If Tavares is the backbone of this team, Okposo is its personality.) And Thomas Vanek was on the backside of his prime when the Isles acquired him in 2013. There are few stars – if any – who carry as heavy a load as Tavares, whose team’s fate is so closely tied to their performance, and 91 bears that burden with broad shoulders. In the games that Tavares has recorded at least one point this year, the Isles are 16-5-1. When he’s been held off the scoresheet, they’ve won just eight of 22. Of those eight wins, only two deserve mention: Dec. 3 vs. St. Louis, Jan. 4 vs. Dallas. The rest have come against bottom-feeding teams, but this is a circuitous route to a simple point: without Tavares, the Isles go from a very good team to a very average one. The realization that must be stirring in Snow’s mind is that the Isles have been “without” Tavares (i.e. no points) this season far more than usual. In fact, with 31 points through 42 games, Tavares is scoring at the slowest rate of his career since his rookie season. The reasons for that can be debated, but the implication is clear. The Isles need another forward of comparable talent because their ambitions suddenly outstretch their potential. There’s a silver lining in that notion that shouldn’t be ignored. The Islanders, in light of their recent growth, have shifted their gaze from making the playoffs to winning the Cup. That reflects well on prospect development, roster management and resource allocation, to say nothing of the players and coaching staff. The goal of every organization in this league is to push its team into legitimate Stanley Cup contention – after that, it’s a total toss-up – and the Isles are almost there. But “almost there” won’t cut it. A team that’s “almost there” might win a couple games in the playoffs. They might even win a series. But they won’t win four in a row, not when its best of seven, not when the competition stiffens as the field narrows. The Islanders were “almost there” last year. They pushed the Capitals to seven games in the first round, and then hit a Coliseum-sized wall. 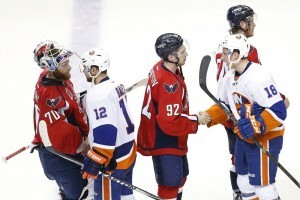 Remember that final game in Washington, the Isles’ season on the line? Remember how impotent they looked? They had gone as far as their talent could carry them. This year’s team is a carbon copy of last year’s. What reason is there to think a different outcome awaits them? It might not be the Capitals who beat them and it might not be the first round in which they bow out, but make no mistake: The Islanders, as currently constructed, are not winning the Stanley Cup. Still, they’re not that far off. They’re strong on the blueline, especially with the continued emergence of Calvin de Haan. Between de Haan, Nick Leddy, Travis Hamonic and Johnny Boychuk, the Islanders’ top four defensemen are as good as any in the Eastern Conference. Their goaltending has been terrific all year, and the stalwart play of Thomas Greiss should allow Jaroslav Halak – Jaro!! Jaro!! – to enter the playoffs fresh. And up front, the supporting cast behind Tavares is big and versatile. But Tavares needs help. Not the kind of help that carries the weight with him, but the kind of help that lifts it up alone. The kind of help that can untether this team to its captain, and, for Pete’s sake, untether its captain to opposing defenders. Take a look at the recent Stanley Cup champions. They all had a dynamic 1-2 punch in their forward ranks that the Isles are visibly lacking. The Blackhawks (2015, 2013, 2010) had Jonathan Toews and Patrick Kane. The Kings (2014, 2012) had Anze Kopitar and Jeff Carter. The Penguins (2009) had Sidney Crosby and Evgeni Malkin. The Red Wings (2008) had Pavel Datsyuk and Henrik Zetterberg. The Bruins (2011) might be the only exception, but they were a confront-at-your-own-risk bulldozer, a well-oiled, unbreakable machine. The Isles are good, but they are not that. They won’t survive without another individual playmaker and it’s up to Snow to find one. Eric Staal? 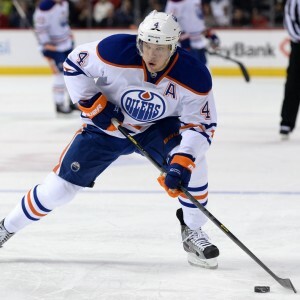 Taylor Hall? Matt Duchene? Gulp; Steven Stamkos?? We’re not saying it’s easy. Those kind of players don’t grow on trees, and when they’re available they come at a steep price. But the Islanders have assets to move, starting with Hamonic, who has requested a trade, and, yep, Okposo, who the Isles are likely to lose in free agency this summer. A package that begins with those two would be very hard to turn down. Snow, if he wishes, can stand pat and march into the playoffs with the team he has today. We still haven’t seen the Islanders fully healthy and firing on all cylinders, and it may be that the sum of their parts is more than it was last year. But that sounds like wishful thinking. It sounds like a reluctance to face the facts. And what a disservice that would be to this Islanders team, bearing down on its target, the holy grail in sight. But they’re not that far off.